Cities around the United States regularly check the hygiene standards in restaurants. This information is either then buried away on obscure government websites or displayed out of site in the restaurant itself. Especially if the results aren’t good. 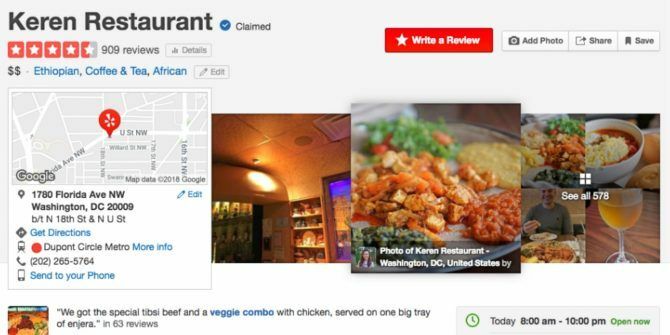 Yelp is trying to change this by prominently displaying the health inspection data on business listings. Thus, potential diners 10 Tasty Netflix Documentaries for Foodies Everywhere 10 Tasty Netflix Documentaries for Foodies Everywhere Netflix is home to some truly astounding documentaries. This list recommends 10 Netflix documentaries made for anyone who takes their food seriously. Foodies, in other words. Read More will be able to see, at a glance, the cleanliness and hygiene levels of the restaurant they’re considering visiting. Now, Yelp is incorporating more of the HDScores database into its listings. This means the number of business pages displaying health inspection reports will more than triple. Which makes it even more important for restaurants to maintain cleanliness levels. Yelp is rolling this out state-by-state over the next few months, starting with restaurants in New York, California, Texas, Illinois, and Washington DC. Eventually, its LIVES (Local Inspector Value-entry Specification) program will be nationwide. Yelp’s hope is two-fold. By giving diners better access to health inspection data it’s hoped they’ll make more informed choices, thereby lowering the instances of food poisoning. It should also improve standards across the board, as restaurants up their game. Not everyone is going to welcome this change. Restaurants who have previously received poor grades for hygiene are likely to suffer until their listings are updated. And it only takes a few quiet months for most restaurants to go out of business. Regardless of the morality of this change, Yelp isn’t perfect, so you may want to check out these Yelp alternatives Yelp Can't Be Trusted: Try One Of These Alternatives Now Yelp Can't Be Trusted: Try One Of These Alternatives Now Yelp has lost some ground when it comes to trust. At this point, Yelp's reviews have little redemptive value and users should look to an alternative service when finding local businesses. Read More . And if you’re a keen foodie who dines out a lot, check out these helpful apps which help you decide where to eat 5 Helpful Apps for When You Can’t Decide Where to Eat 5 Helpful Apps for When You Can’t Decide Where to Eat Can't decide where to eat? Then you need at least one of these apps. Read More .